Charles Omenihu is a sports management major. The class of football, however, has assigned Texas’ senior defensive end the most homework as of late. The 6-6, 275-pound end toyed with the idea of leaving school early and entering the NFL draft. But he said this week that he came to the realization that he “left plays on the field last year” and wasn’t yet ready for the next level. So Omenihu instead spent the offseason studying professional pass rushers like Bradley Chubb, Joey Bosa and Khalil Mack. No college team recorded more sacks last year than Clemson, so he analyzed their defensive ends. He attempted to diagnose what was both right and wrong with his play. That diligence paid off last weekend; Omenihu recorded five tackles, two sacks and a safety in the 19-14 win over Kansas State. The five tackles were one off his career-high. Omenihu had never before earned two sacks in a single game before he pulled off that feat in the span of three plays against the Wildcats. Omenihu has three of UT’s seven sacks. Four of his 15 tackles have been tackles for loss and he’s also forced a fumble. This week, Omenihu will attempt to corral fleet-footed Oklahoma quarterback Kyler Murray. Oklahoma has yielded six sacks this season. Both Omenihu and Murray hail from the Dallas-Fort Worth area and both were in the class of 2015. Omenihu is from Rowlett while Murray starred at Allen. Omenihu’s Eagles and Murray’s Eagles never played each other, however. 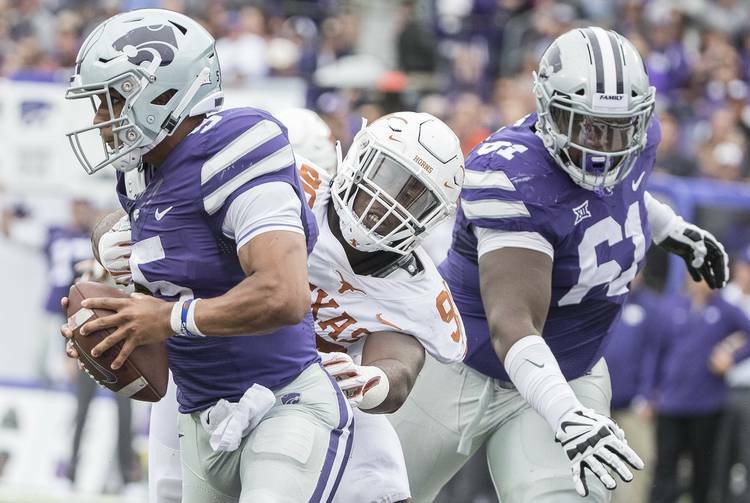 Good grades: Texas’ Elijah Rodriguez said that the entire offensive line graded out at a championship level for their performance at Kansas State. This was the first time all season that the line has accomplished that feat. Texas started Rodriguez, Calvin Anderson, Patrick Vahe, Derek Kerstetter and Samuel Cosmi against the Wildcats. Center Zach Shackelford, who had missed the previous three games with a foot injury, also played. UT scored just one touchdown over its eight possessions, but five of those drives lasted at least 10 plays. Texas compiled 339 yards of offense and allowed two sacks. The offensive line’s biggest highlight, though, may have been when Anderson lined up as a wide receiver on a second-quarter play. The left tackle ran a route, but quarterback Sam Ehlinger did not look his direction. Rodriguez said that based off the way Anderson plays dodge ball, he was confident the 300-pound graduate transfer could haul in a pass. Welcome back: Against Kansas State, Texas junior Collin Johnson had a team-high 51 receiving yards and one of his four catches was a key fourth-quarter grab. He wasn’t the only member of his family who made an appearance at Bill Snyder Family Stadium. Johnson’s brother, junior running back Kirk Johnson, contributed on special teams. It was the first appearance of the season for Johnson, who has suffered a series of injuries since his freshman year in 2015. In fact, he’s played in only two games since Collin arrived in 2016.